Let’s go back in time, a tad bit more than a year if you will. Watch heads across the globe slowly got introduced to the ‘Culét Automatiq Ghost’. A watch that had a lot of publicity right from the get-go. It would take about half a year until this timepiece would see its final form: The Creux Automatiq CA-01. Changing the name from ‘Culét’ to ‘Creux’ had something to do with pronunciation if I’m correct. Anyhow, we got triggered by the watch and couldn’t wait to review it. 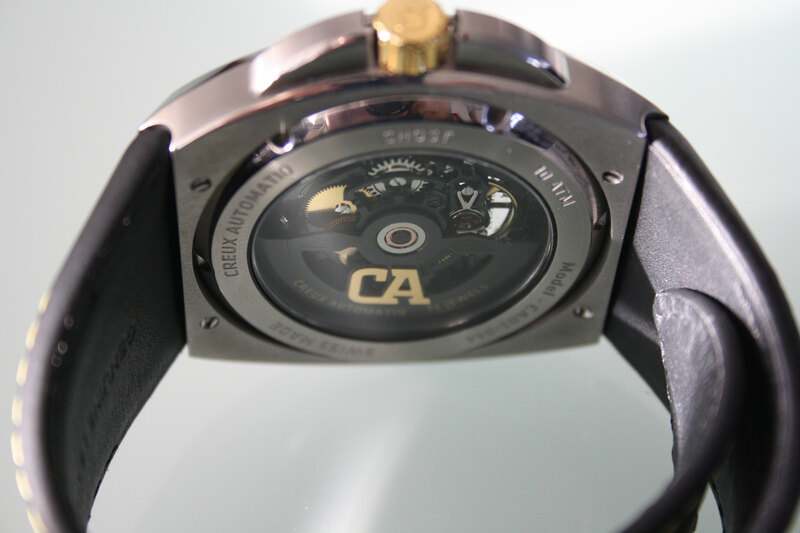 Almost a year later, we got our hands on a Creux Automatiq CA-01. Was it worth waiting? Well, simi would be answered in a personal light of day. However, I do know that I was excited to receive the watch, since there was such a buzz surrounding the introduction of this timepiece. I had to judge it with my own eyes, ready for yet another deception in watch land, or not. That was the question I asked myself. What’s funny about watches like the Creux, is the fact that a watch with such design instantly attracts reactions from pro-Royal Oak and pro-Big Bang activists. Since it took some time before we received it for review, I had plenty of time to read a few comments here and there. Almost everyone said ‘it’s a mix of a Royal Oak and a Big Bang’. To be honest, that perfectly shows the amount of knowledge the screamers have. Because, this watch has more similarities with an IWC Ingenieur, than 50 AP’s and Hublots with the same biological dad. As far as that makes sense. Anyhow, don’t get me wrong. The fact that the Creux Automatiq shows similar design ethics compared to other famous watches, doesn’t mean the watch is instantly bad. Not at all. You see, there’s nowhere stated and officially licensed that only AP has the right to use screws in their bezel. Nor has Hublot. Nor has IWC. It’s like saying that each car with two taillights and two headlights looks exactly like another one, except for the Fiat Multipla. I can imagine it can be quite annoying for a brand to be compared with the big boys and slaughtered because 90% thinks an AP is the only brand you can wear without being publicly harassed by @Shameonwrist. So what I’ve decided to do is quite radical, to be honest, it’s an industry first. The following piece of text has never been implemented in the industry in this way before, please do not try and copy it – that’s way to traditional. 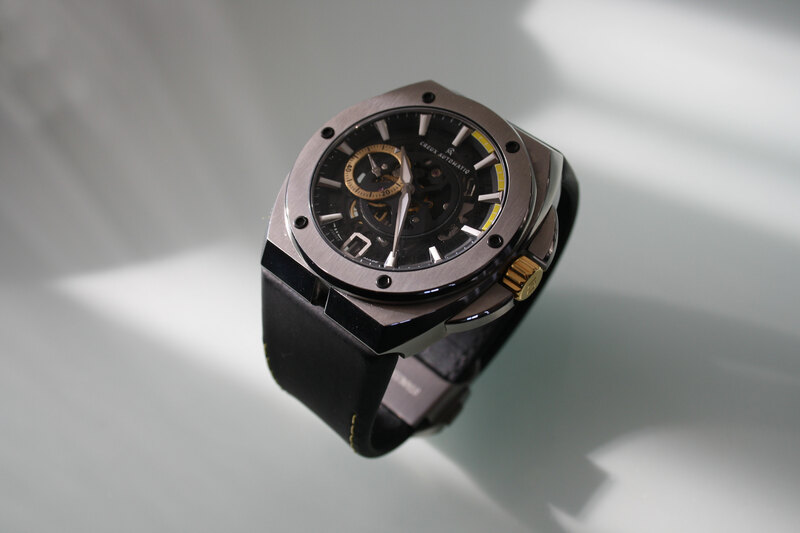 So I thought it would be a cool thing, to really review the Creux Automatiq CA-01 without comparing it to other watches. Laying the focus only on this timepiece, I want to show the world – or at least our readers – comparing it with existing models isn’t a necessity. So first things first, I received the watch included packaging, certification and strap tool. What I appreciated about this watch is the fact that – although the box is rather normal – it immediately feels luxurious. I can’t find any flaws in the process of unpacking and examining the whole product. Some people might appreciate a full diamond Swarovski swan on their packaging, me personally – I do not really care about those things. So thumbs up to Mr. Rumble and Co.
Fair enough, a watch has to be comfortable at any time. However, I find it very important that a timepiece feels solid. It has to have a certain weight and you should be scared of breaking things when holding it. Exactly that feeling is what I have with this piece. As soon as I take it out of the box, it feels like an adult watch. No nonsense, no poor quality in material and above all: no underweight Victoria Secret’s model. However, together with my wish for proper weight, comes the demand for a good fitting strap and practical design. When the watch lays in the palm of my hand, it’s not bad if it weighs a few grams – but when it’s strapped around my wrist, it should disappear. So would the Creux do that? Find out after the commercial break. And then, at the most important moment of my review, I came across a little speedbump. You see, it’s very nice if a watch fits your wrist perfectly. Now, I do not know if Aussie wrists are so much bigger than Dutch wrists, but it was too big for my wrist. And by too big, I don’t mean diameter, I mean strap length. I hear you thinking ‘isn’t the strap adjustable?’. Yes it was, and yes I did adjust it to the smallest size possible – still too big. Of course, that minor incident doesn’t mean end of review. I just wore the watch a bit further back on my wrist, not much, and it was perfectly wearable that way. What’s properly done with this watch – in my eyes – is the width of the strap and the material that has been chosen. 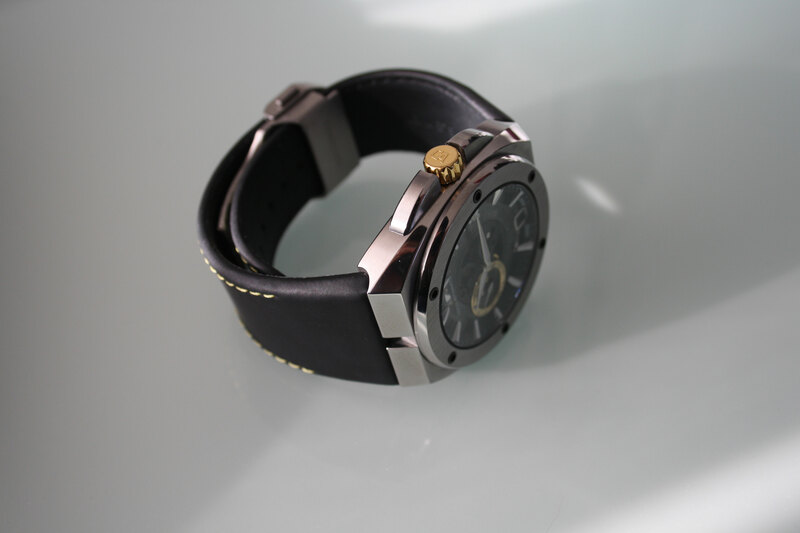 It fits extremely comfortably around your wrist, and gives enough support for the heavy watch case. Furthermore, the folding system is fairly simple, but executes its task perfectly. What I do like to know is how this watch and strap wears when temperatures reach 30 degrees. As I can imagine it gets a bit sweaty around your wrist then. So, now the most important thing of each timepiece: the design. 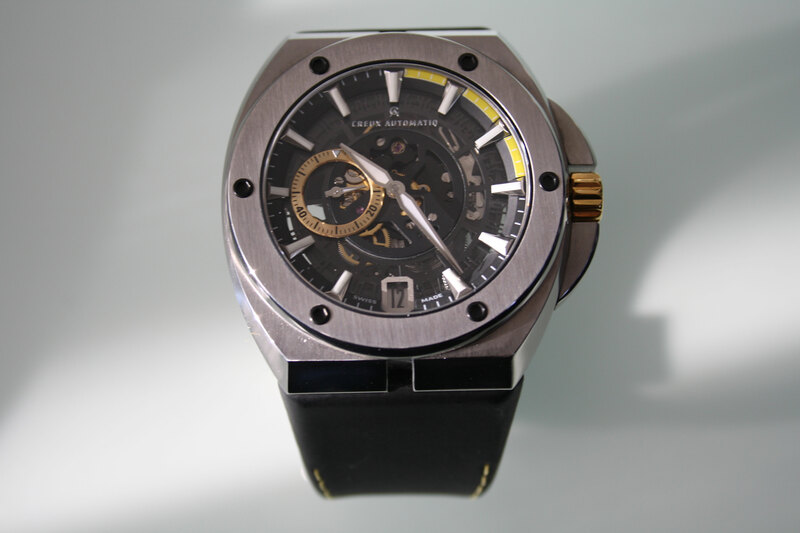 The looks of a watch are by far the most important element of the whole process of buying or not buying. Yes, movement specifications are important, and price is too, but if a watch doesn’t appeal, all these other aspects are out of the window. Say what you want, but you will only dive deeper into a watch if it attracts you. Period. Yes, I can’t deny that certain designs crossed my mind when I saw the Creux Automatiq for the first time, but I promised not to compare, so I won’t. I really like the design. Not because it’s so recognizable, but because it’s so well-finished. All of the flat surfaces are brushed, and all of the edges and remaining surfaces are polished. Giving the watch a really luxurious look. The skeletonized dial is really intriguing too. The slightly angled indices assure that your eyes are attracted to the centre of the dial. The use of the golden colour as seen on the crown for the sub-dial, is perfectly in balance with the black and grey overall colours of the watch. The first 15 seconds from 12 o’clock until 3 o’clock are marked with a yellow strip on the index ring. I’m not quite sure about that aspect, but leaving it would be less appealing. Maybe changing it to white would make it better balanced. The way of skeletonizing the movement is done nicely, however, I seems to be a bit minimalistic. I would love to see this watch with even more see-through effect. Finally, what disturbed me a bit in the details, was the date ring. The date window at 6 o’clock has a grey background, the date itself is black. When these two are combined with the light hitting it, it can be quite hard to properly read the date. Of course, this is not a very big issue, but that’s why I started this statement with the word ‘details’. Most of the times, details are small. So is this point. Creux decided to collaborate with a Swiss movement producer, familiar with making movements for other brands too. No, it’s not ETA or something you find on forums. What it is, I can’t tell you. This watch is the first one that uses this particular movement and I must admit, it looks pretty fly. With 33 jewels, 36 hours of power reserve and a small seconds at 9 o’clock, I think it properly ticks boxes – for a watch priced at a bit over €2000. The finishing of the movement seems not to complicated, but the almost totally blacked-out movement is cool enough to make you forget that aspect. After all, we are in a whole different price category here. 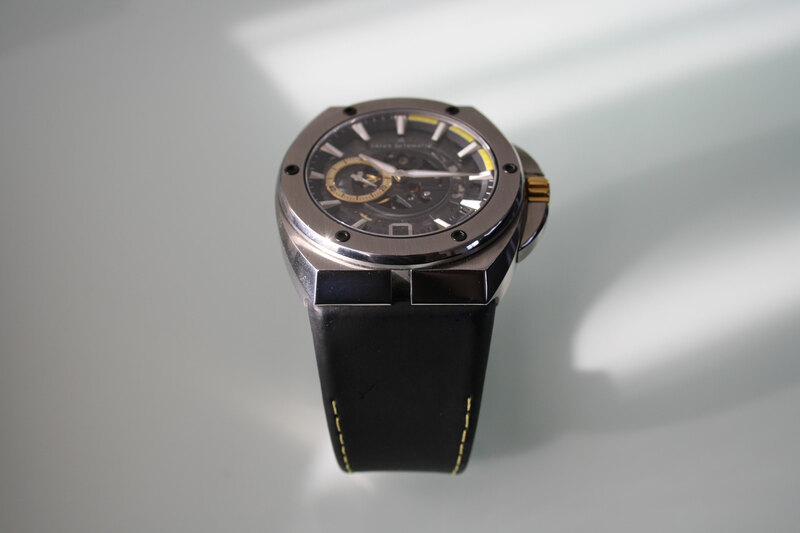 I think that the Creux Automatiq CA-01 is a lot of bang for your buck. 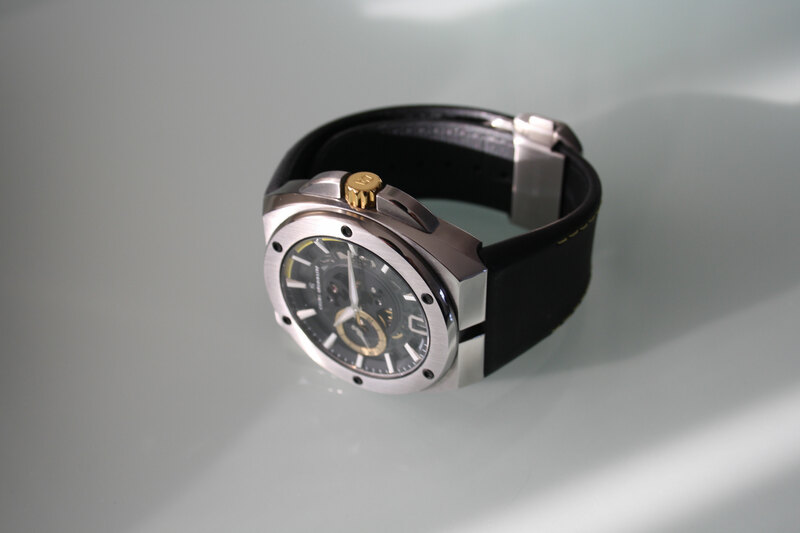 The watch gives you the idea you have a properly produced product. It’s not only the idea, I think it’s safe to say the product is indeed properly produced. The shape of the watch is really appealing, the choice to use different finishes for different surfaces came out very nicely and the movement fits the concept perfectly. For the amount of euros you need to leave behind, this timepiece is definitely worth evaluating. I think a job well done for Mr. Dane Rumble. It’s very important to approach this watch the way it should be approached: without comparing it to bigger brands or iconic other models. 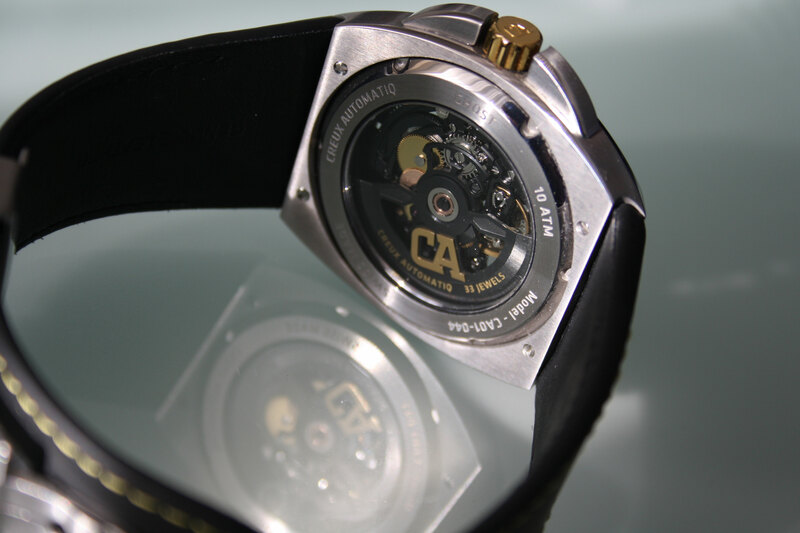 The Creux Automatiq CA-01 is itself and it should be.